Since 2005 we have been formulating Oral Care Products that naturally fight Dental Issues and allow teeth to remineralize. We are thrilled to add to our line two products that not only clean, but brighten your teeth naturally. 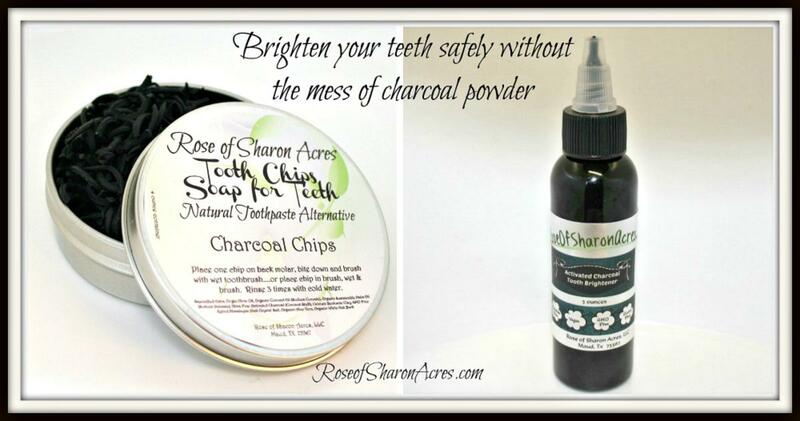 Both of these products, the Charcoal Chips and the Charcoal Paste, contain Ultra fine food grade Activated Charcoal made from 100% Virgin Coconut Shell, Calcium Bendonite Clay, Organic Aloe Vera (for gum health), Pink Himalayian Salt (for Minerals), GMO FREE Xylitol (Bacteria fighter) and White Oak Bark (for gum health). Because Activated Charcoal is alkiline, it works to remove the acidic plaque from the teeth making it the ultimate tooth purifier. Through the drawing of toxins, Activated Charcoal is helpful in changing the PH and health of your mouth making it an effective aid in preventing cavities and killing the bad bacteria that results in tooth decay and gingivitis. The Calcium Bendonite Clay contains minerals that teeth need every day. Like all of our Oral Care products, our Activated Charcoal products contain NO Glycerin which prevents minerals from getting to your teeth thus hindering the re-mineralization process that comes through saliva.